Traditional natural clay is lovely to work with, for both sculpting or pottery. However it needs a kiln heated to 2000 degrees Fahrenheit to get fired in. If, like most people, you don’t have access to a kiln, then clay is pretty much useless to you. You can sculpt in other materials of course. Paper Mache and Plaster of Paris are two traditional options but they have very different properties to clay. Paper Mache is a great modelling material but doesn’t have any of the durability of fired clay, you certainly cannot put paper mache plates in the washing machine! Plaster of Paris is messy, wet and hard to use as a sculpting material. However there are viable alternatives to natural clay that have the same (or similar) properties and consistency and can be used when access to a furnace is not an option. When it comes to true alternatives to natural clay the two best (and readily available in the shops) that I know of are the man made modelling clays ‘DAS Pronto”and oven hardening polymer clays such as “Fimo”. DAS Pronto is a grey or terracotta coloured modelling material that feels very similar to traditional clay. It turns white or light teracotta when drying. DAS has been around since the 1960s so it has a long history of use by artists and modelmakers. It feels slightly grainy between the fingers and if you really look closely there is a fine fibreous element in there. If left in the open air it will dry within 24-48 hours to a texture similar to natural clay. You can slow the drying process a bit by keeping it cool. DAS is water based just like natural clay so water can be used to smooth it. Liquid slips can also be used to fill cracks in dry shrunken clay. I personally dislike the fibrous feel of the clay. There is something about it that doesn’t appeal to me. The fine cracks that appear in DAS once dried are another aspect that will ruin the look of some pieces. Of course for other pieces, the cracking might add to the aesthetic appeal of the finished work. It is all down to personal taste. 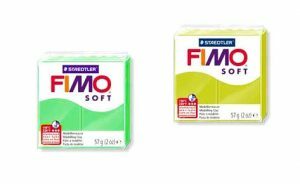 Fimo is a plastic polymer based clay. When first removed from package Fimo is very stiff and hard to work. It must be kneaded before use, but a few turns through a pasta roller also does the job brilliantly and as a nice bonus creates thin slabs of smooth clay. This warmed, kneaded clay is easy to work with. It has an identical consistency to plasticine. It stays soft for months until hardened at a fairly low heat for half an hour in the oven. Chemical softner can be used to make the clay even more pliable. Once cured Fimo is both waterproof and very durable. Fimo comes in a huge range of colours and through blending them together you can achieve any hue you fancy. The downside is that if you accidentally have the oven up too high toxic chemicals can be released into your kitchen. The oven should never be higher than 150degrees centigrade and the clay goes from soft to hard in about half an hour or less. 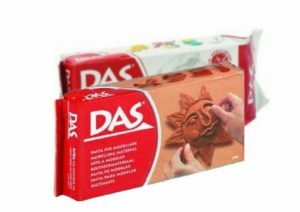 For expressive, quick builds when fingerprints add something to the finished model, DAS is a great alternative to natural clay, but when you are painstakingly building a perfect maquette with a totally smooth finish Fimo is an excellent choice. Free Paper Models to download and build yourself.